This set includes one, full-sized 9-day candle which has been fully dressed and blessed by me and one 1/2 ounce of my Saint Michael oil! The Archangel Michael is the closest to the Lord in the Jewish scriptures, for his very name means "Like Unto God." As the eldest Archangel, he is given captaincy of all of God's natural phenomena, including rain, wind, fire, snow, thunder, lightning, and hail. Michael is believed by many Jews to have appeared to Moses as the fire in the burning bush and to have led Daniel from the lions' den. In the Christian Bible, Michael is said to be the Angel who told the Virgin Mary of her approaching death. According to Muslims, Michael's body is covered with fine hairs and each one, like a tongue, implores the Mercy of Allah on behalf of sinners. As the Archangel of battle and defender of Heaven, Michael is said to be the Patron Saint of policemen. Additionally, because it is said in the Book of Revelations that Michael will lead God's troops against the dragon and his angels at the final battle, many people seek the aid of Michael against wrong-doers on Earth and all people in need of protection from crime or from physical or spiritual enemies may petition the Archangel for help -- and many have reported benefits from keeping an Angel Michael novena candle burning in the home. It is said that those who light a novena candle to the Archangel Michael and recite the 91st Psalm will be under his protection as long as the candle burns. Contact me if you'd like a customized candle for him. There are a total of seven Archangels according to ancient Jewish beliefs -- one for each day of the week. The four best known are Michael, Gabriel, Raphael, and Uriel (Oriel) -- and in African American hoodoo folk magic or rootwork, two of them are associated with a powerful natural curio called Angelica root or Archangel root. 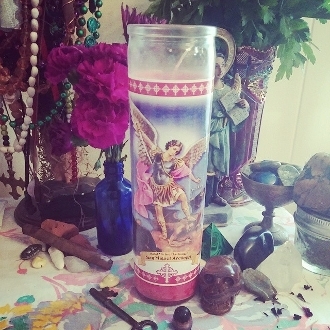 Archangel Michael, the eldest, is used with Angelica root as a defender of women. Archangel Gabriel who is concerned with the announcements of pregnancy, is allied with this root in its role as an herbal tonic for women's reproductive health. Great Archangel Michael Archangel, defend us in battle, be our defense against the wickedness and snares of the devil. May God rebuke our enemies, we humbly pray; and do thou, O Prince of the heavenly host, by the power of God, thrust into Hell the Adversary and all other evil spirits who prowl about the world for the ruin of souls. Each statue measures about 8 inches tall and comes with a red candle and my Saint Michael Sacred Image oil! He is painted in deep colors of burgundy, bronze, emerald green and pale yellow.